Find a place to call home with Sunnyfield. Sharon, Kim, Nicole and Renee recently settled into their new home that has been designed to suit their needs. Located on the Central Coast, they are within walking distance of shops, cafes and a short drive to the beach. 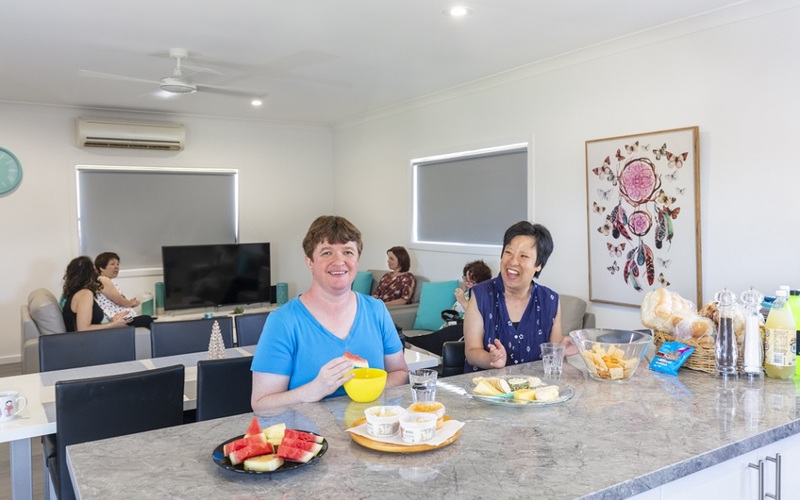 Sunnyfield’s Shared Living experts are available to support people with intellectual disability and their families with accommodation planning, NDIS Shared Independent Living (SIL) funding, navigating through the NDIS and developing a personalised support plan. At Sunnyfield we understand that everyone has different lifestyles and support needs, we will work in partnership with you to provide a range of tailored accommodation solutions throughout NSW. Can I use my NDIS funding to access these supports? To access our shared independent living services, you must be an NDIS participant and have approval for funding in the following area. Where are these services available? Sunnyfield is now taking expressions of interest for the following NSW locations, please fill in the online form below and one of our team members will contact with you within two business days. If you have future accommodation goals and would like to find out more about Shared Independent Living, start the conversation today and contact our friendly team by calling 1300 588 688 or filling in the online form. Sunnyfield can assist you to design a personalised plan to support you to achieve your personal goals and identify what supports you may need to get there. Join in the spirit of Sunnyfield and spend a day as a corporate volunteer at one of our sites. When Helen started with Sunnyfield Enterprises, she expected to find a new profession, what she got was a friend for life. Click here to view Helen’s journey with Sunnyfield.